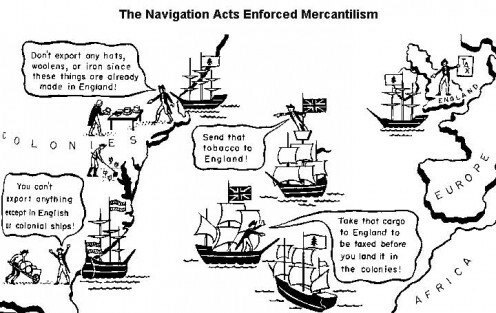 The navigation acts made it so that trade to and from the colonies could only be done with English ships. The law also said that any trade outside of British land first had to go through London. This earned England a lot of money and made trade between the colonies take much longer. 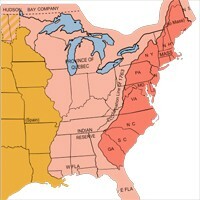 The Proclamation of 1763 was created after the French and Indian War. It made an imaginary line over the Appalachian Mountains and said that no colonists could colonize west of it. The king made this line so that Britain didn't have to pay to protect colonists from Indian attacks. This made the colonists angry that they couldn't colonize the Ohio River Valley. 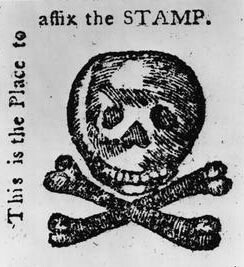 The Stamp Act was a law made by the British parliament that taxed all paper products in the colonies. The tax was created to pay the debts from the French and Indian War, and caused the colonists to be angered by the British government. Because of the taxes, Sam Adams created the Committees of Correspondence to inform other colonies how to protest against the taxes. Because of the protests against the Stamp Act, Britain sent more redcoats to the Americas. 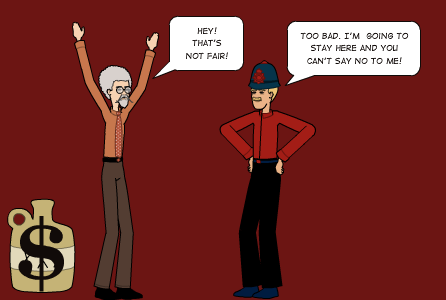 Britain created a law called the quartering act, and said that any Redcoat will be forced to live, be fed, and sleep at any colonist's house. It also added the writs of assistance that let a redcoat search a colonists house without any reason. Both of these laws angered the colonists. The Townshend Acts put a tax on many different items, including Glass, Tea, and Oil for lamps. 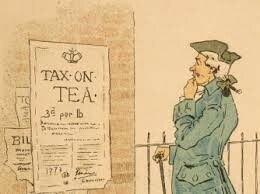 By the year 1770, most of the taxes had been destroyed, except for a tax on tea. 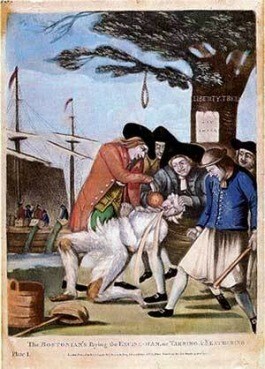 The Sons of Liberty responded to the taxation of tea with violence towards the important British in the colonies. 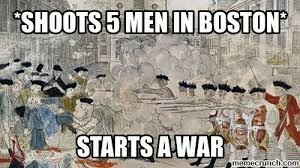 On March Fifth, 1770, 5 people died during the Boston Massacre. Samuel Adams created propaganda against the Redcoats following the attack. Though John Adams, Sam adams brother, chose to represent the redcoats in court following the attack. The Tea Act was a law made that said that only the British East India Company, or the BEIC, were the only ones who could sell tea in the colonies. This created a monopoly for the BEIC, and made the colonists angry. 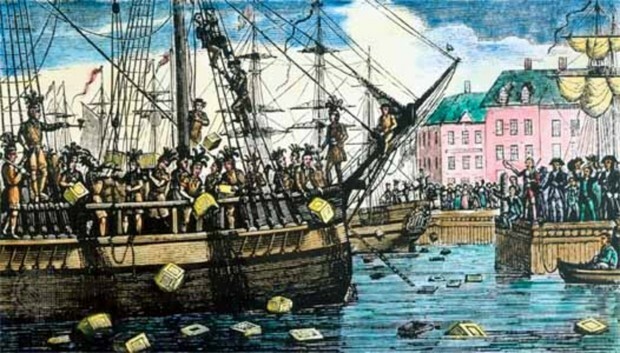 In protest, the Sons of Liberty dressed as Indians and dumped boxes of Tea into Boston Harbour. Though it was officially called the Coecieve Acts, colonist called it the Intolerable Act because of how mean it was. The law stopped use of the Boston Harbour, and gave Britain all control of the colony. This law lowed the economy of all the colonies. 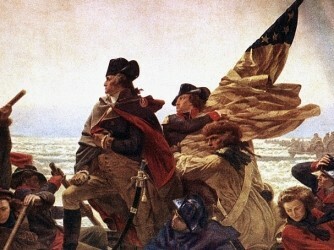 The American revolution was a war fought against Britain for the independence of the Colonies. Some social causes to the American Revolution were the Proclamation of 1763, the Quartering Act, the Intolerable Acts, and the Boston Massacre. What were some of the British economic policies that led to the American Revolution? Some economic policies that that Britain made were the Stamp act, the Tea Act, and the Townshend Acts. Do you think colonists were justified in declaring independence from England? I do think that the colonists were justified in declaring independence from England because England was being unfair to the colonists.